Walnut Tree Cottages01873 852797work Self-cateringTwo picturesque cottages next door to the Michelin Starred The Walnut Tree, just a short walk through the garden. The cottages are called the Old Post Office Cottage and Ivy Cottage. Both have terraces outside, and gardens. Both Ivy and Old Post Office cottages are separate from the restaurant, and whilst you will be very comfortable, there is no room service. But the cottage kitchens are well stocked with comestibles for snacks and breakfast. The newly refurbished Ivy Cottage is next door to The Walnut Tree just a short walk through the garden. The cottage has two double bedrooms, with 6ft king size beds and a large bathroom to share. For four person occupancy the cottage is £240.00 per night. Three people pay £200; two: £160. There is an entrance hallway, study, open kitchen and sitting room with a conservatory leading off from it. A terrace outside of the conservatory leads down to a garden and beyond that to our vegetable garden for The Walnut Tree. 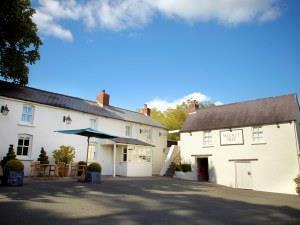 Two picturesque cottages next door to the Michelin Starred The Walnut Tree, just a short walk through the garden. The cottages are called the Old Post Office Cottage and Ivy Cottage. he Old Post Office Cottage is a short walk through the garden and adjoins Ivy Cottage. The cottage has two double bedrooms, both consist of six-foot king size beds and handmade pocket-sprung mattresses. The stairs to the bedrooms are quite steep. There is a kitchen with breakfast table, large ground-floor shower room and lavatory, and small sitting room with TV. A terrace leads to the garden.